I finished a Conjuring of Light a few days ago and I decided that, instead of reviewing only the third book in this trilogy I would give my overall thoughts on the series! This series is very hyped up but, in case you never a heard of it before, here’s a little synopsis of the first book. A Darker Shade of Magic follows Kell, one of the last Antari, magicians capable of traveling between parallel universes, more particularly between different Londons. Each London has unique characteristics: White London is savage, ruled by two insane rulers, Grey London is magic-less unlike Red London where magic is everywhere and Black London is now destroyed and inaccessible. Kell is from Red London and, being the only Antari of his universe, he is the only link between his London and the other ones and he has to carry messages between the different Londons’ rulers . The only rule he has to follow during his travels is that he can’t bring relics from an universe to an other one because it can disturb the balance between worlds, but, of course, rules are meant to be broken. Kell can have evrything he wants, but what is better than forbidden things? So he decided to smuggle things from one London to another… until he smuggles something that might end up destroying his world, something from Black London. What he doesn’t know yet is that the only person capable of stopping this is Delilah Bard, a ruthless young thief who tried to rob him in Grey London. In my opinion, this series is not really a groundbreacking trilogy, it’s fun and I can see why a lot of people love this, I probably would have if I had read this five or six years ago but still. I mean, it definitely has some cool elements, you can except a lot of battles, magic tournaments and pirates: in its ideas this series has a lot of potential but, for me at least, it never really managed to deliver on its promises. First and foremost, the books are all way too long for what they are trying to do, especially the second book A Gathering of Shadows, which suffered from an extreme case of “second book syndrome”, its intrigue did not stand on its own at all and it ended with a cheap cliffhanger. The third book, A Conjuring of Light was also too long, but, its lenght wasn’t as useless: a couple of side stories felt a bit unnecessary but it wasn’t painful to read either and the ending was satisfying. However, I think this story would have been told better as a duology and not a trilogy. The characters were interesting enough even if Lila managed to get on my nerves quite a bit, it was obvious that Schwab was in love with this character but, I personally wasn’t. She was too rude, too stubborn and too frustating for me. In the last book, I liked her a bit more but I still found her to be a cliché YA fantasy heroine. However, I liked Rhys and Kell quite a bit and I really loved Alucard and Holland who were for me the most interesting characters out of the bunch. So even if this trilogy wasn’t memorable, it was fun and it definitely had good elements: the worldbuilding is cool, the characters are nice and the plot was pretty decent. It was a bit repetitive for my liking, but still, it was still enjoyable. Overall, I can see why people would like this series even if I don’t think it is worth the hype, I am pretty sure I will forget this story pretty quickly but still, I’m glad I finished it. Have you read this trilogy? Did you like it? Carina is a former neuroscientist with a drug problem, she constantly has urges to murder people and, to prevent that, she is destroying herself by taking Zeal, a drug allowing humans to enter a virtual reality where all their dreams are materialized. For Carina, Zeal is her only opportunity to kill people without actually murdering anyone and, in her Zeal space she can summon murderers and kill them slowly, just like she wants it….Until the day her Zeal space is hijacked by a vision of a girl being killed by one of her ex-colleague working at Sudice Inc, Carina’s former employer. Sudice, a company making neurological implants allowing humans to be connected at all times, is now working on a new brain-mapping project that might not be as innocent as claimed, meaning that it might involve a few murders. Carina soon realizes that the vision was sent to her by Mark, a man who used to work for Sudice and who’s now missing after discovering incriminating information about the new project. Mark sent all the information he had through the vision he sent Carina but, to access them, she has to unlock some memories once taken away from her and that she doesn’t especially want to recall. In order to expose the project, she will have to work with the Trust, an organization of people who wants to stop Sudice and put an end to her Zeal addiction, all of that without murdering someone in the process, which might be harder than it seems. 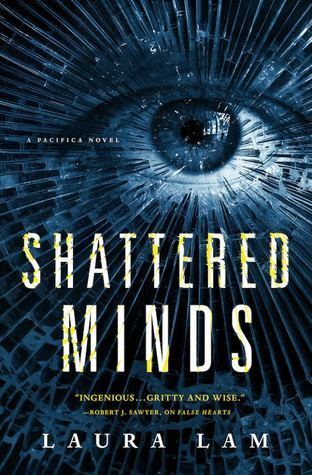 Set in the same world as False Hearts, Lam’s previous novel, Shattered Minds is a dark science fiction thriller filled with evil companies, corruption and murders. It would make a terrific movie or TV shows, the world felt vivid and it was fascinating to see how the society worked in this dark future. The pacing of the story was very interesting as we constantly jumped between past and present as Carina unlocked her memories and it definitely kept the story moving. If you are a fan of stories with evil and corrupt companies, I think Shattered Minds will be a real treat for you. I enjoyed the story quite a bit as it was an interesting thriller with cool sci fi/cyberpunk elements and my only complain is that I wished the characters were a bit more complex. Since Carina was the main character, she was a bit more developped but some of the side characters felt a bit flat. However, I liked the fact that some of the chapters had different POVs and I especially appreciated the ones following the antagonist, it was really interesting to see her motivations and her reasoning. It was my first Laura Lam book and now I am very intrigued by her other works, especially False Hearts since it is set in the same universe and I really enjoyed reading about this dystopian near future America, I don’t know if she will write other books in the same universe but if she does, I am definitely interested! I received a copy of this book for free from the pupblisher Tor Books through Netgalley. All opinions are my own. The 2017 Clarke Award shortlist was announced at the beginning of May and, as I did last year, I want to read the entire shortlist. The Underground Railroad by Colson Whitehead: a brilliant and thought-provocking book that 100% deserves the award. Occupy Me by Tricia Sullivan, a very weird but innovative book that I discovered thanks to this year shortlist, it’s definitely one of the most surprising book I read this year. Central Station by Lavie Tidhar, a book filled with incredible ideas but that was lacking cohesion in my opinion. A Close and Common Orbit by Becky Chambers: I still can’t understand why it was shortlisted, I found it dull and quite boring to be honest. I finished this book about a month ago and I debated reviewing it or not for a while. I finally decided to review it to get the final Clarke post out of the way so I can focus on other things but I don’t have many things to say about this book. I think it is an interesting work and I can see why Newman is appreciated so much but I don’t think this book was for me. 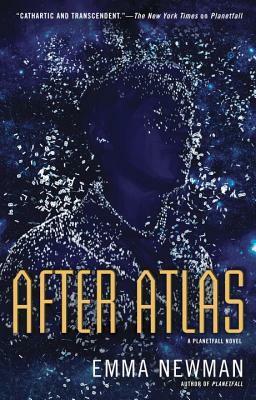 After Atlas follows the story of Carlos Moreno, a detective owned by the Neuropean Ministry of Justice in a close future where corporations are able to buy poor people off and turning them into perfect little slaves. Carlos can’t marry, be in a relationship or have children, as written on his contract. Even if he’s not extremely happy about it, he can still live with it (it’s not like he has a choice, he can’t take his own life anyway, it’s on the contract) because he loves his job and he’s very good at it. Well, until the day he has to find the murderer of, Alejandro Casales, a famous cult leader, a man Carlos used to consider as his father. I will be quick here but I think this book made a poor thriller, it had loads of very interesting concepts and ideas that were used quite well but the mystery part was a let down for me. I don’t read a lot of thrillers but usually, the part where you learn who the killer is is supposed to be a huge thing, a great reveal or something that makes you say “oh god, I did not expect THAT”. Well, it wasn’t the case with this book for me at all, when we learnt about the killer and his motives, I pretty much rolled my eyes, the reveal did not answer most of the questions I had and I left me underwhelmed. However, some other things in this book were done quite well. I was very interested to learn about the way Govcorps could basically buy human beings and how this whole system was put in a place in this world. Carlos’ story was fascinating, his perspective on his situation and his childhood experience with The Circle, the cult led by Alejandro Casales were horrifying and thought-provocking. The world Newman created felt real, and, in a terrifying future, you could imagine a society like that actually existing and that was one of the strongest aspect of After Atlas in my opinion. 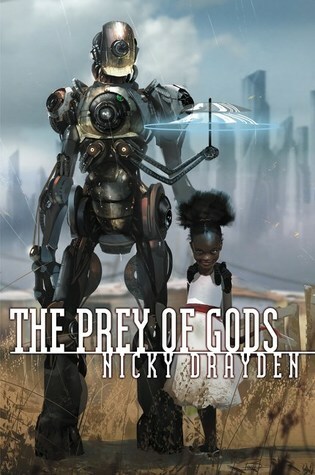 So, even if I wasn’t blown away by this book, the characterization and the worldbuilding were very interesting and the ending suprised me enough for me to considering read the next book set in this universe. Because of those aspects, I can see why it ended up shortlisted even I don’t think it’s one of the best SF books published last year! Other than that, I don’t have much more else to say, if it sounds intriguing to you, I would still recommend it, just don’t expect After Atlas to be the best mystery book ever.